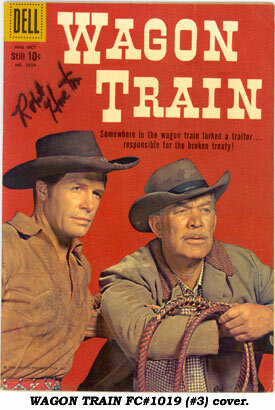 The popular “Wagon Train” TV series began on NBC in September 1957. 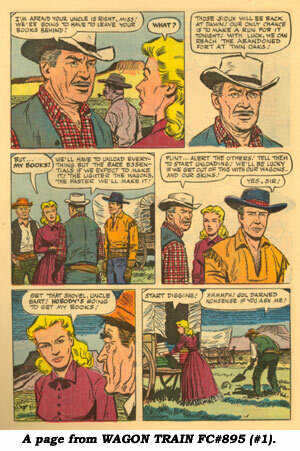 Dell Comics boarded the train in March ‘58 with Four Color #895 (#1). The second issue, FC #971, came out in the fall of ‘58, but for whatever reason the third issue, FC #1019, didn’t hit stores until nearly a year later, dated August-October ‘59. Regular numbering began with #4 (Jan./March ‘60) and was published quarterly through #13 (April/June ‘62)…this was just before “Wagon Train” switched networks and moved to ABC in September ‘62. 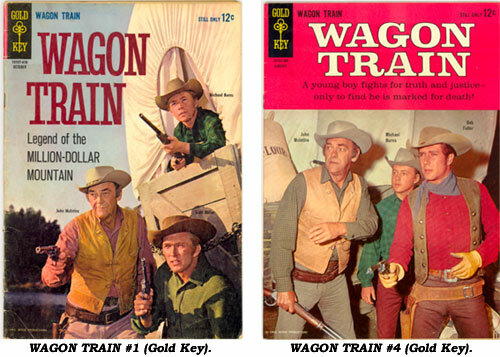 Readers saw no more issues of WAGON TRAIN until Gold Key revived the comic in January ‘64. Four Gold Key issues were published quarterly ending with #4 in October ‘64. Dell FC #895 (#1) had a Ward Bond photo cover. FC #971 (#2) through #10 all had both Bond and Robert Horton photo covers. #11, 12 and 13 each sported Horton with new wagonmaster John McIntire. By the time of the GK revival the cast of the series had changed even more, so GK covers #1, 2 featured Robert Fuller, John McIntire and Michael Burns. #3 had Fuller and McIntire alone with #4 showing McIntire, Burns and new scout Denny Miller. All four GK issues had back cover photos also. Many of the Dell issues also had inside front cover photos with FC #971 (#2) being a real treat, having photos on all four outside and inside covers! In the beginning the WAGON TRAIN comic stories featured only wagonmaster Major Adams (Bond) and scout Flint McCullough (Horton). Other series regulars were not included until #6 where the cook is referred to as Chuck rather than Charlie Wooster (Frank McGrath). Then, from #7 on, he is called Charlie or Wooster. Even though John McIntire as wagonmaster Chris Hale is on the cover of #11 the stories only feature Flint and Charlie Wooster. The story in #12 features Chris Hale, Flint and, for the first time, Bill Hawks (Terry Wilson). No Wooster. The final Dell issue, #13, starred Flint, Chris Hale and Wooster. 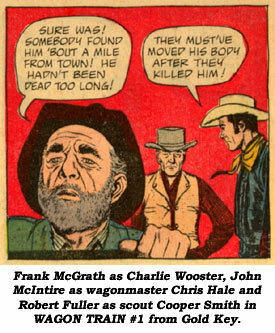 When Gold Key revived the comic the series cast had changed so the Gold Key issues all featured Robert Fuller as Cooper Smith, John McIntire as Chris Hale, Michael Burns as Barnaby West and Frank McGrath as Charlie Wooster. #3, 4 also included Bill Hawks’ character. As mentioned, Denny Miller as scout Duke Shannon was on the cover of #4 but was minimally shown in only a few inside panels and never named in the story. Many of the stories were scripted by Dell regulars Eric Freiwald, Robert Schaefer and Paul Newman. Various artists handled the art chores including Nat Edsen (1909-2001), Dan Spiegle (1920- ) and Warren Tufts (1925-1982). Incidentally, there are also “Wagon Train” stories in the revamped WESTERN ROUNDUP Dell Giants #22-25 (April/June ‘58 to Jan./March ‘59). 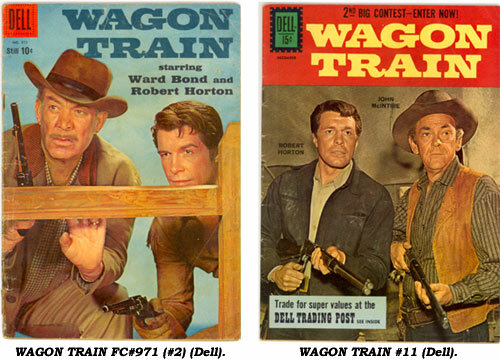 Dell’s WAGON TRAIN FC #895 (#1) is listed in OVERSTREET PRICE GUIDE at $30 with other Dell and Gold Key issues fetching $18-$20. The Giant size WESTERN ROUNDUP issues bring around $27.